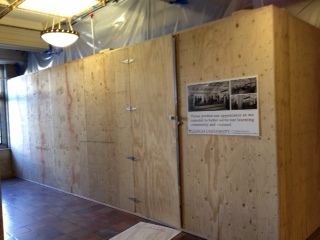 For those of you who do not know, there are many changes being made to Packard Lab Lobby. One of the main changes that they are making is moving the car to a more open space where people can see it from all sides. They will also be adding power strips to the tables already in the lobby so that people can charge their devices. This place will likely be the new base for the work study students. Another change is that the screens that can be seen as the you walk in the front door will be replaced with new large screens that will be placed along the wall on the left as you walk in. In addition they will be making a semi-private conference room behind the car. They expect to be done with the renovations in May 2014. 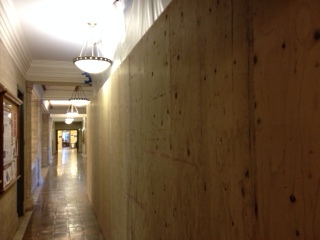 Below are some pictures of the lobby work, most of which is behind the wooden walls. Also, there is a link to see the renderings for what the lobby will look like when it is all done. ← Why are you in this class?